It’s always in the plan: an event that delivers that coveted “wow” factor attendees will be talking about long after the conference comes to a close. One element that can put wow almost immediately in reach is the space itself. While there are many ways in which a venue can stand out, delivering a mesmerizing view may well top the list. 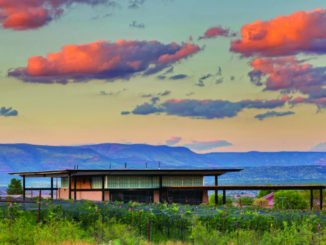 Arizona has an embarrassment of riches when it comes to venues with engaging views. From the northern canyons to the southern mountains, Arizona cities and towns offer groups a striking selection of venues with views to remember. Located an hour and a half from Grand Canyon National Park and alongside the largest contiguous Ponderosa Pine forest in the continental United States, Flagstaff is home to Northern Arizona University and is a designated Dark-Sky City. Once the residence of museum founders, Dr. Harold S. Colton and his wife Mary-Russell Ferrell Colton, this historic home sits amid the pines and provides an intimate setting for retreats, conferences and events. Built in 1929 with Craftsman-era architectural details such as timber beams and multihued tile floors, Colton House offers inspiring views of the San Francisco Peaks, the highest mountain range in Arizona. The house includes a patio and lawn and accommodates up to 75 for any event. Two full-service hotels are located about 10 minutes away. Little America Hotel has 247 guest rooms and 13,770 square feet of meeting space; Doubletree by Hilton offers 183 guest rooms and 6,243 square feet of space. Prescott lies about 100 miles north of Phoenix and 128 miles south of the Grand Canyon. Hundreds of its buildings are on the National Register of Historic Places and it enjoys a moderate Mediterranean climate thanks to its elevation at 5,400 feet. Granite peaks, lakes and Ponderosa Pines define much of the surrounding landscape. Hassayampa Inn’s Rooftop Terrace invites groups to enjoy the view over Everybody’s Hometown, as Prescott was once known, extending to Thumb Butte and the Bradshaw Mountains in the distance. The 960-square-foot terrace accommodates up to 150 for receptions and 80 for dinner. Opened in 1927, Hassayampa Inn has 67 guest rooms and 12,000 square feet of function space, including two ballrooms and three boardrooms. 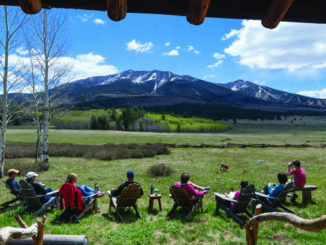 Williams lies within Kaibab National Forest. It’s the southern terminus of the Grand Canyon Railway but offers a slew of other experiences, too, including hiking, fishing, a wildlife park and eclectic shopping. What could be better than a venue with ever-changing views along 65 miles of spectacular landscape between Williams and the Grand Canyon? The train departs Williams each morning, taking 2 1/4 hours to reach the park where passengers spend several hours exploring before the return journey. Groups can reserve a car of their choice for a private experience. Car capacity ranges from 24 to 88 and service options include coach, first class or dome class. In summer, two trains depart daily, one from Williams, one from the Grand Canyon. Grand Canyon Railway Hotel is located next to the depot. In addition to 297 guest rooms, a pub and an indoor pool, the hotel has two meeting rooms, each accommodating about 60. Sedona’s mystique as a center of positive energy is rivaled only by the power of its inspiring landscape, a grand tableau of red-rock formations, high desert terrain and the unexpected lushness of Oak Creek Canyon. Airy and contemporary with a 2,800-square-foot open communal space and 640-square-foot deck, Creekhouse overlooks Oak Creek and the verdant lawn beside it. The house is ideal for gatherings from intimate dinners inside for C-suite executives to cocktail and dinner functions in the outdoor spaces. Recently renovated, Creekhouse can accommodate 100 for cocktails on the deck, 100 for dinner on the lawn and the inside space can be used as a dance floor. Intimate L’Auberge de Sedona features 62 cottages, 21 lodge-style guest rooms and offers 3,500 square feet of indoor meeting space and four outdoor venues. It’s ideal for groups of 10 to 150. Evocatively nicknamed Valley of the Sun, the expansive Phoenix metropolitan has long been a driver of Arizona’s tourism and conference business. It has no end of worthy resorts and venues. Here are just two of them. Opened in 2012, Hotel Palomar added style and panache to downtown Phoenix and created one of the city’s coveted function venues on its third floor. Lustre is a 5,824-square-foot inside-outside space that includes the inviting pool deck and sweeping views of its downtown neighborhood. Lustre can accommodate up to 250 guests. The boutique Hotel Palomar offers 242 guest rooms and 10,000 square feet of meeting and function space across 10 meeting rooms. Blue Hound Kitchen & Cocktails is the onsite restaurant. The name says it all. Top of the Rock sits atop a butte and provides 270-degree views north, west and east. The restaurant’s panorama includes the buttes of Papago Park and downtown Phoenix. From the expansive patio, views take in downtown Tempe, Camelback Mountain and Phoenix. Top of the Rock accommodates 200 for a reception and 140 for a sit-down dinner in its approximately 5,000 square feet of space. Phoenix Marriott Tempe at the Buttes features 353 guest rooms and a total of 25,013 square feet of meeting space, including 15 meeting rooms. Separating itself from neighbor Phoenix, Scottsdale is home to some of the state’s most alluring resorts and arguably its best shopping. But Scottsdale has also retained its authentic Western heritage, providing a cultural richness that ups the ante on allure. Not all views are about nature. Exquisite Sanctuary offers multiple venues with spectacular views, but XII, a private dining space, may offer the most engaging view with its huge windows opening into the kitchen where the chef prepares the group’s meal. Diners can have a champagne toast in the kitchen at the chef’s island to start the evening before settling down at the table for 12 for the main event. A more traditional view is offered from the resort’s 5,000-squarefoot Infinity Pool Deck, where those gathered are treated to what may be the most mesmerizing sunset view in Scottsdale. The pool deck accommodates 150 for a cocktail reception, 125 for banquet seating. If tables are set up on the east side of the pool for optimum sunset effect, views also include Piestewa Peak, Mummy Mountain and Camelback Mountain. Sanctuary, on 53 lofty acres, offers 109 guest rooms and seven private homes for accommodations, along with 5,400 square feet of indoor meeting space. 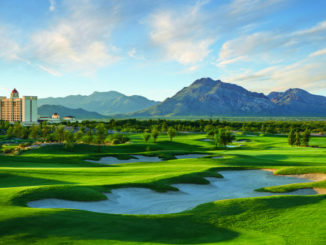 About a 45-minute drive northeast of Phoenix, the small community of Carefree features a rugged high-desert landscape, mild winters and the considerable amenities of Boulder Resort & Spa. Tables with elegant linens can be set on lush, green grass cradled into a backdrop of dramatic boulders and desert terrain. This is Promise Rock, an event site that lives up to the romance of its name, an exquisite venue 2,288 feet above sea level that accommodates 80 for a cocktail reception and 60 for dinner. From this secluded spot guests are treated to fiery sunsets and a panoramic view of the valley below. The Boulders features 220 guest accommodations including 160 casitas and 61 villas and provides 50,000 square feet of indoor/ outdoor meeting and event space. There are six onsite restaurants. Marana attracts outdoor enthusiasts with its miles of hiking and biking trails and easy access to Saguaro National Park and the rugged Tortolita Mountains. It’s located just 27 miles northwest of Tucson but is a destination in its own right. The views from Kiva Terrace start at the lush green golf course it overlooks and extend to the Tortolita Mountains beyond. The 600-square-foot terrace can accommodate up to 40 for dining—an ideal end to a day that can also include a corporate golf tournament at the Golf Club at Dove Mountain. Sitting at 2,300 feet, The Ritz-Carlton, Dove Mountain offers 253 guest rooms and some 30 venues in its 44,000-plus square feet of indoor/outdoor meeting and function space. Once the capital of the Arizona Territory, Tucson is the state’s oldest incorporated city. Its combination of modern urban amenities and proximity to a phenomenal trail system through a compelling mountainous landscape gives it appeal for many kinds of travelers, including those attending conferences and events. 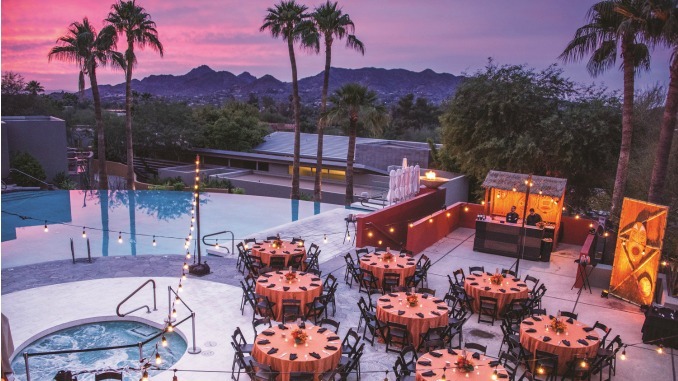 The expansive 15,000-square-foot Ania Terrace can handle 2,800 for a reception and 945 for dinner—complete with views of the mountains of Saguaro National Park, the golf course and the sparkling city lights of Tucson below. The resort provides 575 guest rooms and 80,000 square feet of meeting and event space accommodating up to 3,300. The JW also has a spa, golf course and five restaurants.